We believe giving should be meaningful, simple, and fast. That’s why we built a comprehensive suite of digital giving tools for ELCA congregations and ministries! Exclusive Benefits for ELCA congregations. 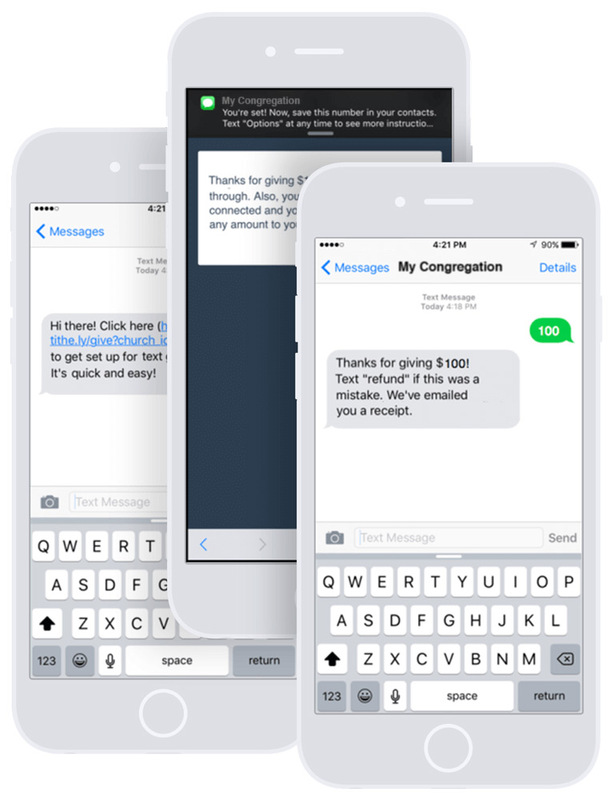 For congregations looking to get started with mobile giving. No monthly / setup cost. Install in less than 30 seconds. 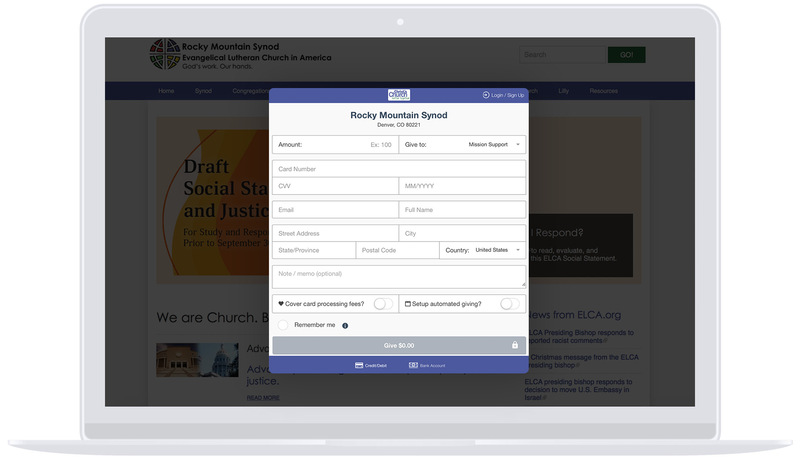 Add a Tithe.ly donation form and make it simple for your members to give on your congregation website vs. redirecting them to a third party giving page. 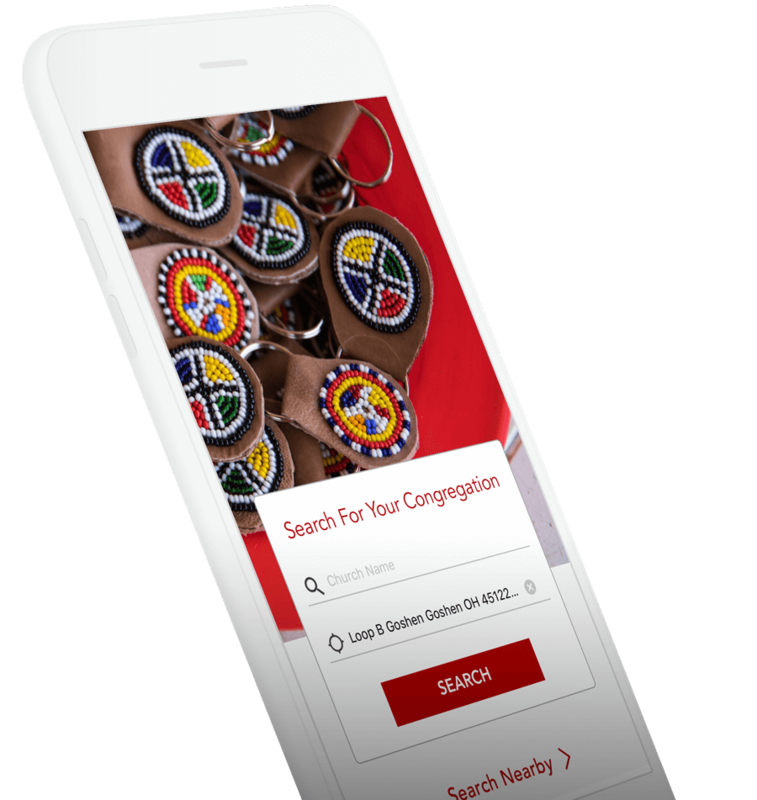 Plus, your online giving form will be mobile optimized, ensuring your donors have a delightful experience when giving through your website on their mobile devices. Still allowing members to enter credit or debit card info on envelopes? No problem! 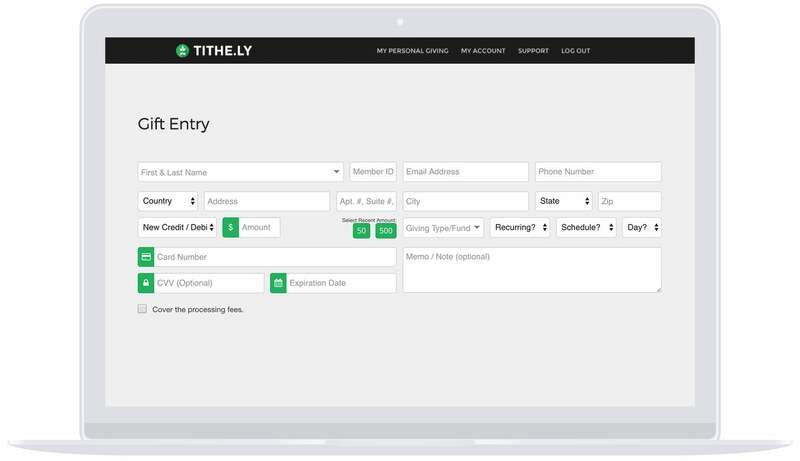 With Tithe.ly you can process all of those gifts in bulk or one at a time. Long gone are the Monday mornings spending hours doing data entry. 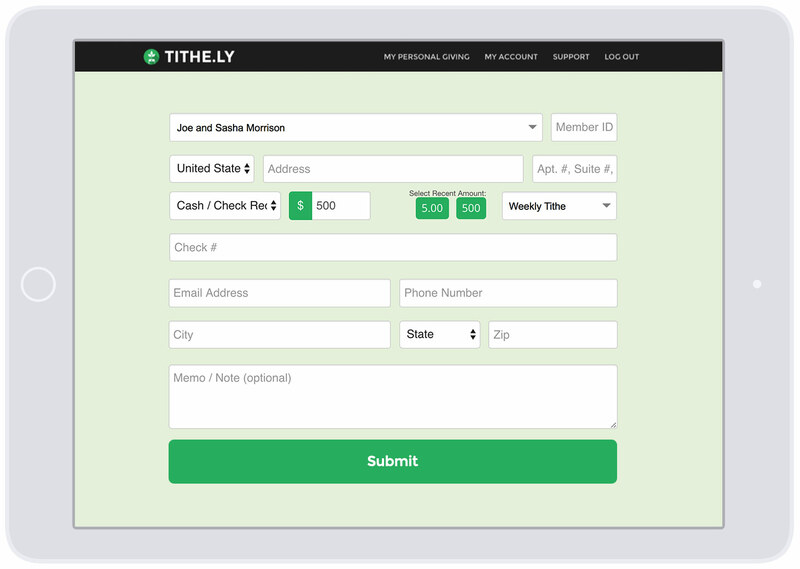 With Tithe.ly, every tablet or laptop computer instantly turns into a simple giving Kiosk. Enable giving for your members and visitors as they enter or exit the building, fellowship with friends, or enjoy a cup of coffee in your cafe. 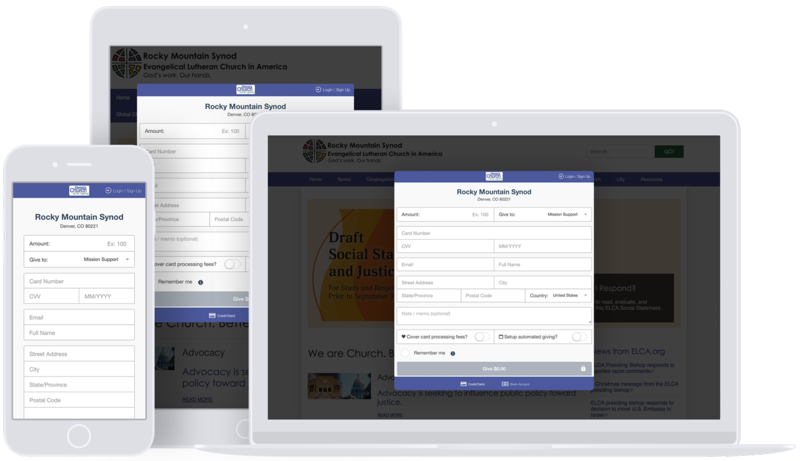 "As our synod’s communicator and event planner, I needed something that would work with our existing digital platforms and was easy to navigate. 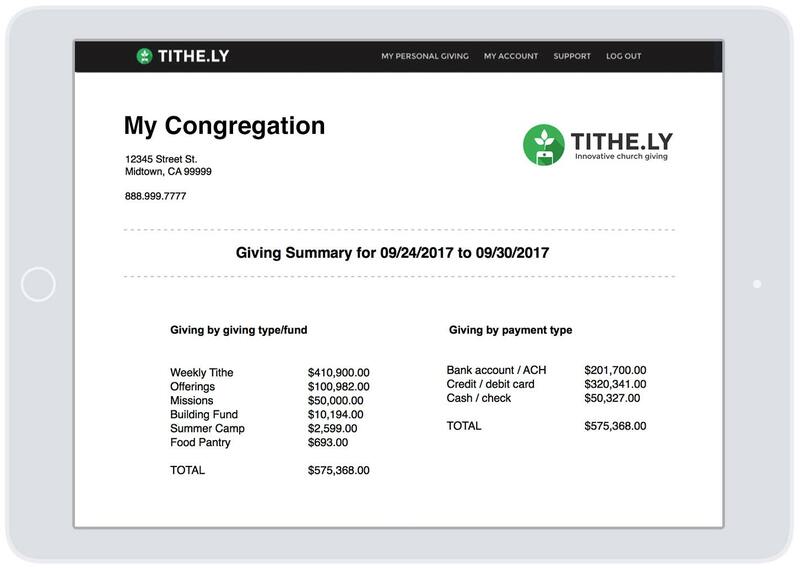 Tithe.ly is flexible enough to support our multiple accounts, regular mission support giving, event registrations, and special campaigns seamlessly. Andrew and the Tithe.ly team have been stellar in making sure we are getting the most out of their current products while working to create new tools their clients are looking for!" 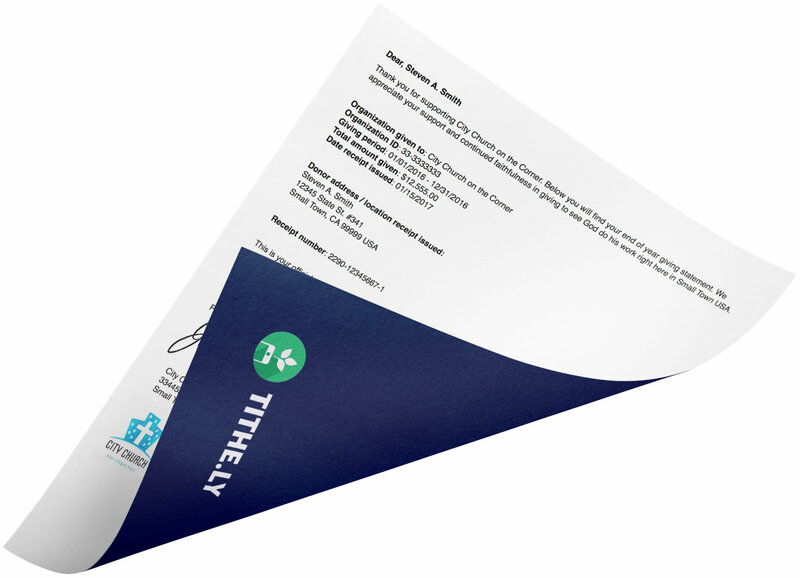 On top of the five ways to give, Tithe.ly provides easy to use, yet feature packed tools that enable your administrative team to do more, faster! Passing the plate to collect cash and cash gifts is still the most common way of giving to the local congregation. 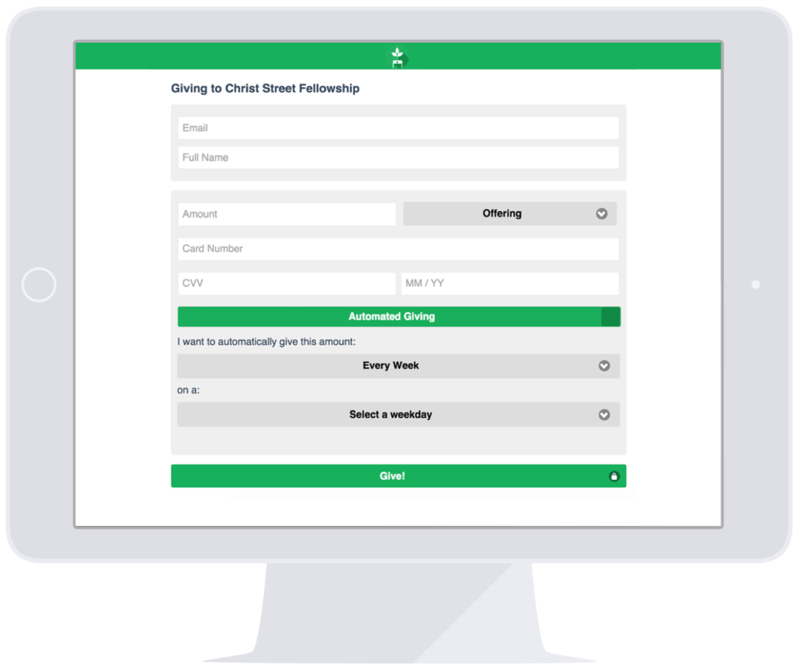 Leverage Tithe.ly cash and check gift entry tools so you can track your online and offline giving in one consolidated system. 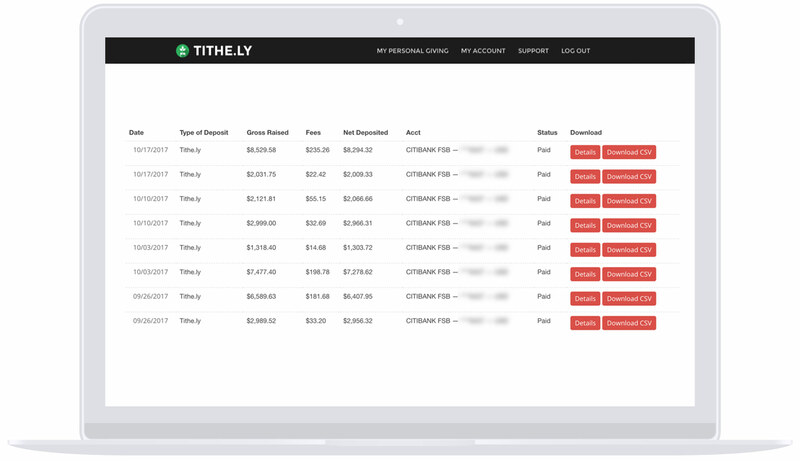 Tithe.ly admin reporting tools make it easy for you and your staff to see each and every gift, registration, or payment as well as detailed deposit reporting for every deposit we make into your bank account. Understanding giving and generosity brings key insights into the health of your congregation. 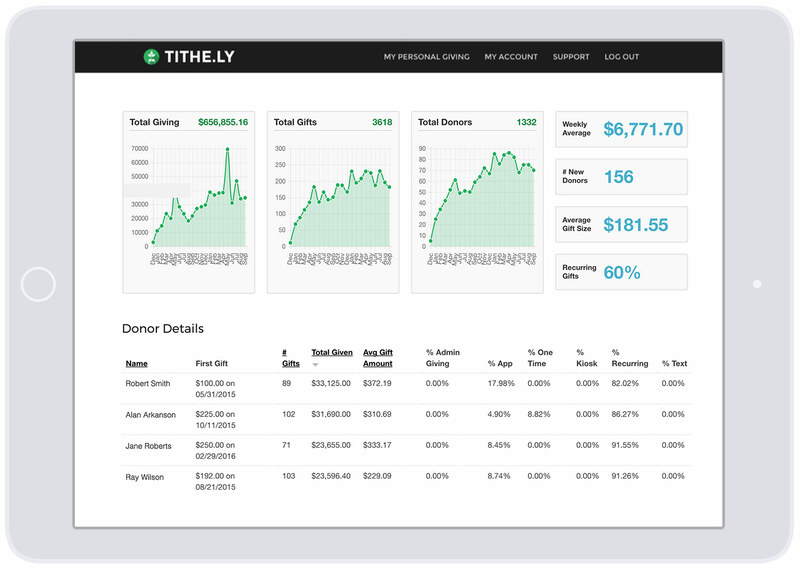 The Tithe.ly giving dashboard surfaces information that allows you to track against budget, see growth, understand giving trends, and much more. We’re obsessed with making things simple. We’ve taken the friction and complexity out of everything, from the way people give to the way you signup your congregation. Tithe.ly was born mobile first. From text-to-give to our mobile giving app, everything has been built for the mobile generation! Allow giving without creating an account. Great for one-time gifts via iPad Kiosk in your congregation's lobby or for use in small group settings. See full gift / transaction / deposit reporting that includes all the info you need to manage financials. Plus, easily download .csv file if needed. Create another congregation for members to give to and even deposit into different bank accounts.